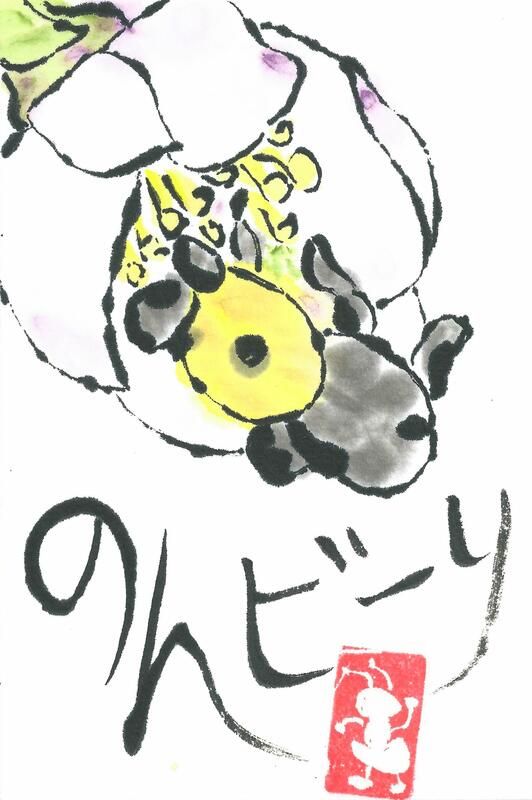 This card features a pun I made up in Japanese… The Japanese word is “nombiri” or “carefree.” I wrote the “bi” (ビー、pronounced “bee”) part in katakana, with the rest of the word　（のん　and り）　in hiragana (learn about the difference here). The effect of this mix of syllabic characters is that, for those who can read Japanese, is that it really sounds and looks more like the English word “bee” to match the image. The effect for those who don’t read Japanese is, I hope, a pretty picture of a flower with a bee on it, plus some scribbles below the image! The etegami was painted after a visit to the National Arboretum in Washington, DC, in April 2015. I took this photo of a flowering quince (related to chaenomeles), with a bee feeding on it.